The fast-food industry, including Burger King, supplies most of the jobs for first-time workers who serve customers in various settings including over-the-counter and drive-through. These fast food restaurants typically offer food items including French fries, hamburgers, hot dogs, fried chicken, fried fish, roast beef sandwiches, Mexican food, cold meat sandwiches, and pizza. Food workers have the responsibility to prepare and serve customers and work in a variety of areas including the kitchen, serving area, housekeeping, and exterior area. While these jobs tend to be low-paying, only a minimum requirement of education is usually required. Employers expect job applicants to understand basic mathematics to know how to handle money, count supplies in stock, and do subtraction and addition quickly when necessary. Typically, the employer, manager or supervisor will provide the recruit on-the-job training including learning job performance duties by working with experienced employees. If you or a family member was injured while working at Burger King, you are likely entitled to workers compensation benefits. Contact the workers compensation attorneys at Rosenfeld Injury Lawyers LLC for more information and a free review of your legal rights and options. A Safe Place to Work? According to statistics by OSHA (Occupational Safety and Health Administration), approximately 28,000 Fast Food Workers are rushed to the local emergency room every year to receive care for a job-related injury. The safety record of most fast food restaurants is troubling at best. Most individuals working in behind the counter and in food preparation are young and inexperienced. This group includes the majority of 2.5 million teenagers working seasonally and year-round at fast food outlets. OSHA statistics reveal that in 2015, the more than 44,000 injured teenagers receiving care in emergency rooms across the nation with 63%, or 28,000, of those injuries occurring in fast food establishments serving pizza, hamburgers, and other “fast food." Comparatively, most fast food related injuries among teenagers occurred in hamburger establishments, followed by pizza places and finally by Mexican and chicken restaurants. Some statistics reveal that teens are likely to experience burn injuries when ignoring safety rules or taking shortcuts. Others are injured after becoming too familiar with the routine and after taking needless risks, usually due to overconfidence. In some instances, the injured worker receives the wrong advice for treating wounds from the store manager, supervisor or lead worker. Punctures and Lacerations – Fast food restaurant workers have frequent contact with broken dishes, slicers, knives, and glasses. Mishandling the sharp objects can lead to serious wounds that require disinfection and immediate treatment to prevent infections. Strains and Springs – Items that are hard to reach or misplaced can cause the fast food worker to trip or overreach when grabbing the product. Also, improper lifting, twisting, and slipping can cause strains and sprains that will require treatment, which might involve muscle ointment, sore muscle heating drugs, and pain medication. Burns and Scalds – Hot stovetops, heated water, boiling fryers, and other heat equipment are potentially extremely hazardous to a fast food worker. OSHA statistics reveal an estimated 12,000 reported cases of severe burns occurring to workers in the restaurant industry. Electrical Burns – Worn electrical cords, damaged wiring, and faulty electrical appliances can cause significant harmful burns and potential electrocution to an unsuspecting worker. Eye Injuries – A splash of the sanitizing chemicals or hot grease from a boiling fryer can cause severe injuries to the eye and face. Immediate medical attention is required to prevent extensive long-term damage to the eyeball, skin and underlying tissue. Lower Back Pain – Lifting heavy stock items delivered to the restaurant contained in boxes and buckets can cause significant lower back pain, bulging discs, and strain vertebrae. Excessive Noise – Working at the drive-thru window can cause damage to the worker’s hearing when cars and trucks produce excessive noise at volumes higher than at 85 db. Toxic Fume Exposure – Constantly opening the drive-through window can expose the worker to elevated levels of toxic fumes emitting from idling cars and trucks in the drive-thru lane. Slip and Fall Injuries – Workers tripping, slipping or falling in a work environment can break bones, bruise muscles and stress ligaments. Exhaustion – Working long hours can produce fatigue, overexertion and mental stress on employees who might not be accustomed to lung schedules. Exposure to Toxic Substances – Workers are exposed to cleaning chemicals and other toxic substances that could cause serious health issues if ingested or inhaled. Repetitive Motion Injury – Performing the same duties repetitively can place unusual stress on ligaments, muscles, and tendons that could lead to carpal tunnel syndrome, shoulder problems, back issues, and neck strain. Workplace Violence – The numbers of theft and robbery incidents occurring at fast food restaurants are on the rise nationwide, including in Illinois. Wrongful Death – Statistics show that the number of fast food restaurant-associated deaths is on the rise, taking the lives of patrons, visitors, and workers. Statistics by the CDC (Centers for Disease Control and Prevention) found that 12% of all workers in the food industry participating in the survey indicated that they had worked while sick with diarrhea or vomiting. The studies show that these workers “were less likely to say that they had worked when they were sick if they worked in a restaurant that was less busy, had a policy for workers to tell their managers when they were sick… or had a manager with more experience. Also, they were less likely to say they were sick when working if they “had workers who could come to work to fill in." 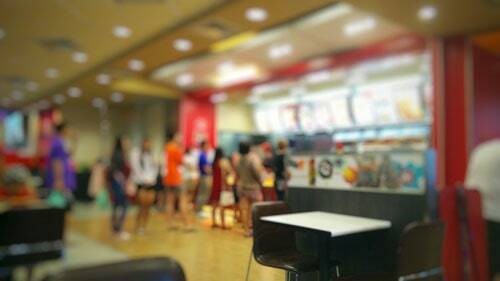 Many potential employees of fast food restaurants are unaware of the always present potential for being robbed or becoming a victim of random violence while performing their job. Over the years, there have been numerous incidents in fast food establishments that have left employees, patrons and assaulters injured or dead. Case 1: Chicago, Illinois – Kankakee County officials revealed that preliminary autopsies on two individuals murdered at a fast food restaurant showed they suffered fatal injuries of multiple wounds caused by a sharp instrument. One of the murdered victims was a 50-year-old Momence Burger King manager, who was stabbed in the upper right back. The other victim was stabbed in the head, chest, and neck. No cash was taken from the registers or safe. Case 2: Frederick, Maryland – A female assistant manager at Burger King was shot and killed by a gunman at the restaurant on E. Patrick St. in Frederick at the beginning of the manager’s shift. Investigators believe that a former 21-year-old coworker is responsible for her death. The investigation took some time because there were no eyewitnesses and little evidence at the scene of the crime. Case 3: Valparaiso, Indiana – A former worker of Burger King was charged with the murder of an employee along with arson, conspiracy, and theft. In an unusual confession, Lori Thomas took thousands in cash from her employer, the Burger King in Valparaiso, before starting a small fire and telling another coworker to get inside the walk-in cooler and “play the role of the robbery victim." However, apparently, no one had detected the fire for hours leading to extensive damage and the death of the worker who “died from hypothermia inside the cooler." Prosecutors charged Thomas as responsible for the death of the employee. Case 4: Providence Rhode Island – Providence police identified a woman who was killed after an assault in a Burger King parking lot in the early evening. While the cause of death was not determined immediately, the victim “appeared to have health problems." However, the 44-year-old assailant was arrested on a felony assault and charged with the murder of the decedent. Case 5: Nashville Tennessee – Metro police stated that a shooting outside of Burger King in Antioch, Tennessee claimed the lives of two men. Apparently, one man died from a gunshot wound while inside the vehicle in the restaurant’s parking lot. The ambulance responding to the call of a shooting injury was flagged down by the other victim. EMT responders transported the victim to the Vanderbilt University Medical Center, where the emergency team pronounced him dead. Case 6: October 2016, Cleveland Ohio – An investigation is underway concerning a murder-suicide that apparently happened at a local area Burger King restaurant. The victim’s relatives and friends claimed that the victim’s abusive ex-boyfriend killed the 38-year-old worker, who was a mother of three. When paramedics and police arrived at the Burger King in the early morning hours, “employees reported that one of their coworkers had been shot by her ex-boyfriend. Police discovered [the victim] had been shot to death. Her ex-boyfriend … reportedly barricaded himself in the bathroom, then took his own life." Any employee who wants to make their workplace safer needs to talk to coworkers, supervisors, managers and the owner. Also, they should note the hazards in the workplace by drawing a map and identifying each issue and look for any opportunity or solution for making the problem less dangerous. Lift heavy objects, boxes, and buckets with the assistance of others. Avoid awkward and unnatural positions especially when working for an extended length of time. Avoid slippery surfaces by keeping the area clean and dry. Report any defective equipment, broken handrails and stairways and other malfunctioning products, equipment and materials that could be hazardous. Avoid standing for a long time without moving while on a hard surface to avoid leg soreness, back pain, and muscle fatigue. Always use sharp knives over dull edge knives that require more force that could lead to a serious cut. Never reach across a hot surface or lit burner, when safe to do so. Avoid repetitive tasks when possible to avoid injury, soreness, nerve damage or fatigue. Ensure the restaurant has provided basic safety measures to every employee to avoid workplace violence. Employers must furnish “each of [their] employees a place of employment which is free from recognized hazards that are causing or are likely to cause death or serious physical harm to [their] employees." Employers must “inform employees of the existence, location and availability of [their] medical and exposure records when [they] first begin employment and at least annually thereafter." Employees can “file a complaint with OSHA if [they] believe there are violations of OSHA standards in serious workplace hazards." Employees can “request information from [their] employer on safety and health hazards in the workplace, chemicals used in the workplace [and] tests the employer has done to measure chemical, noise and radiation levels…"
Employees can request information on the “precautions the employer should take and procedures to be followed if [they], and other employees are involved in an accident or are exposed to hazardous chemicals or other toxic substances." Employees can “file a complaint with OSHA if [they] believe there are either violations of OSHA standards or serious workplace hazards and request OSHA to conduct an inspection." 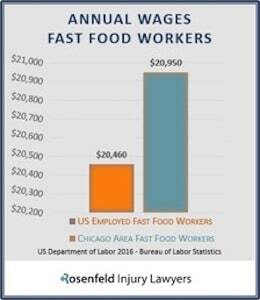 Every injured fast food worker has the legal entitlement to file for Worker’s Compensation benefits against their employer. The employee can also pursue third-party claims if other individuals, companies or entities are also at fault for the harm they endured in their workplace. Our attorneys assist injured Burger King Workers recover financial compensation under the IL Worker’s Compensation Act and through civil lawsuits. Call our office now for a Free Case Review. Our team of dedicated attorneys can cut the red tape, file the paperwork before deadlines, and handle your workplace injury case to ensure your family is compensated adequately for your injuries. We can handle your Worker’s Compensation claim to ensure you receive substantial benefits and help determine if additional parties are also at fault for your harm. Our lawyers working on your behalf can handle every aspect of your case. Their efforts include filing a claim, gathering evidence, building your case, and presenting the lawsuit in front of a judge and jury or negotiating your settlement. No upfront retainers or fees are required because our personal injury law firm accepts every claim for compensation through contingency fee arrangements. This agreement allows your legal fees to be postponed until after our attorneys have successfully resolved your case at trial or through a negotiated out of court settlement. Our “No Win/No Fee" Guarantee means you owe us nothing if we cannot get the money you deserve!